Published by Perrat Press in October 2018. Lindsay and Jon pursue their affair in secret, because if the school finds out, Jon will lose his job. If Lindsay’s dad finds out, there will be hell to pay. But when a dramatic accident turns her life upside down, Lindsay is separated from the man she loves. Events spiral beyond her control, emotions conflicting with doubt, loneliness and fear, and Lindsay becomes enmeshed in a shocking true-life Australian scandal. The schoolyard beauty will discover the dangerous games of the adult world. Games that destroy lives. Lindsay is forced into the toughest choice of her young life. The resulting trauma will forever burden her heart. I've seen a number of superb reviews for The Swooping Magpie on other blogs recently so was delighted to win a giveaway copy at Jaffa Reads Too. The novel is set initially in 1970s Australia and follows its characters up until pretty much the present day. I was reminded of a nonfiction memoir I read, Empty Cradles. That book was instrumental in publicising the plight of children deemed to be 'orphans' who were deported to Australia without their own or their parents consent. In The Swooping Magpie, Liza Perrat exposes another outrage visited upon children by the state - that of forcing young unmarried mothers into hidden institutions for the duration of their pregnancies, where they were coerced into giving up their babies for adoption. Both schemes are horrific to think about, especially considering that Christian religious organisations were often instrumental in carrying them out. 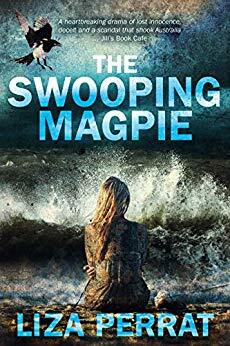 I know The Swooping Magpie is fiction, but it feels utterly authentic throughout so I am sure Perrat did her research well and portrays her findings accurately. The one potential aspect that concerned me prior to reading The Swooping Magpie is that it focuses on mothers and babies and I am not a maternally minded woman! Fortunately Perrat deftly avoids ever being overly saccharine and cutesy. Her women - from selfish Lindsay to heartless Matron Unwin, terrified Helen to silent Dawnie - are richly detailed and believably nuanced. Despite personally being opposed to the actions of many of the characters, I could usually understand exactly why they behaved as they did and remember reflections of similar attitudes during my own English childhood. The idea that a woman will only be a good mother if she wears a wedding ring is fortunately now mostly seen as outrageous. We do though still need to establish that male sexual partners carry equal responsibility for pregnancies. The Swooping Magpie provides an excellent illustration of how far sexual beliefs have evolved over the past half century. This story sounds heart-rending. I'm intrigues by the storyline. Yay for winning this book. I haven't heard of this one before, but that's great that you really enjoyed it. Thanks so much for a great review, Stephanie... so pleased you enjoyed The Swooping Magpie! Loved the read! Looking forward to your next book! Wow, what a book, especially if it is based on truth. I also like that it is in a unique setting and time period and to see how things compare to this current day and age. I am glad you won it and you were able to enjoy reading it so much.